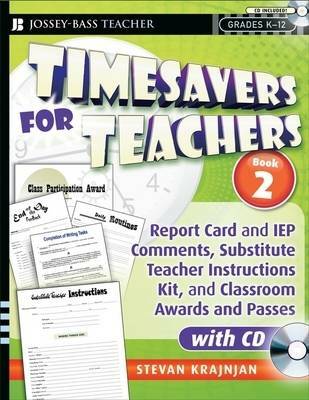 Timesavers for Teachers, Book 2: Report Card and IEP Comments , Substitute Teacher Instructions Kit, and Classroom Awards and Passes combines three great resources into one that will help all teachers simplify their work, personal organization, record keeping, and classroom management, including: Over 1800 ready-to-use and easy-to-find report card and IEP comments for any situation A complete substitute teacher instructions kit, with all the forms your substitute might need to keep the class running smoothly A comprehensive set of attractive classroom awards and useful passes Designed with flexibility in mind, the forms come in several versions and can be used in a variety of settings and situations. Simply choose and use the materials that best fit your personal classroom needs. The companion interactive CD makes completing and printing the forms easy.